beach combing with a kindred spirit is an amazing experience. amazing but you have to learn how to share. i've never met anyone who was as excited and inspired by as many of the same things as the friend i made last year. i ventured into her open studio to find intricate layered sculptures surrounded by wonderful collections of natural objects and beach finds. i didn't know where to look first and was so overwhelmed by it all that i had to go back again the next day. i've always loved searching for interesting, unusual and beautiful objects on the beach. both the experience and what i discover inform and influence my work. in the past, reactions from friends have ranged from totally perplexed and a little horrified (if something was dead) to curious and enthused but still slightly hesitant by some of the things i found fascinating. i've hitch hiked laden with carrier bags of driftwood from the arctic circle in finland back to yorkshire with a boyfriend indifferent to my bleached bone white hoard. i've received two long gift wrapped pieces of driftwood for christmas from lovely friends in devon. i've wandered beaches with friends who've known my taste and handed me their finds along the way. but i've never met someone who collects and sees beauty in so many of the same wonderful and rare treasures to be found. at first it was a bit disconcerting. you're walking along together enjoying the space, the peace, a little lost in conversation. you glance down at the sand and see a tiny pink cowrie peeking out from beneath a pebble. as my brain registers and thinks - oooh, a cowrie, a hand reaches forward and picks it up. but it's not my hand. my brain is still sending that message and it all happens a little too late. echoes of a distant childhood feeling of 'that's not fair' spring forth and with it the desire to be the first to spot the next one. 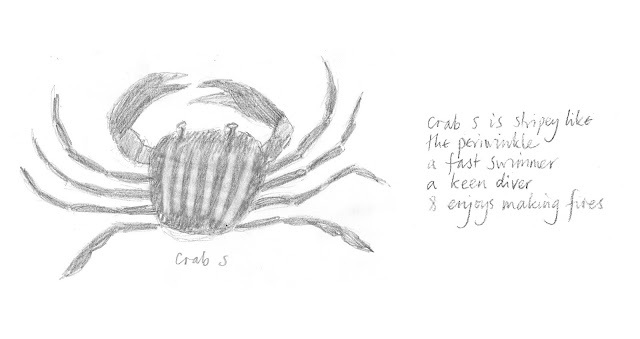 that was my first experience of wandering the strand line with crab s. if we walked together chatting then it was easy to pick up something from under the other's nose. you tend to look slightly forward at an angle as you walk and not always see exactly what's right under foot. if the other person is a few paces apart, the line of their angle can hit the ground at the your own feet. and you can literally whip away something from under the others toes and nose. i think my friend is a little bit faster than me. so now when there is a neat tide line we often make this pattern along the beach. we can still chat and share our finds. 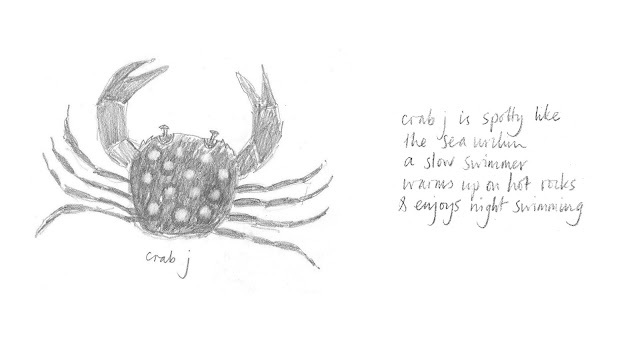 like two little crabs weaving a scalloped border beside the edge of the sea. and just wandering around the beach together must create an interesting abstract design. no neat pattern for as crabs we wander freely. 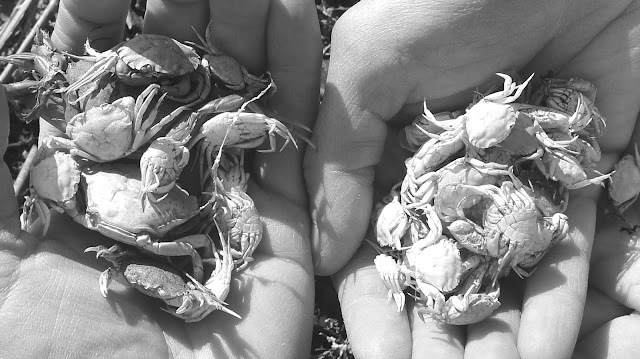 and sometimes we collect crabs too. it's a lovely feeling to be in tune, to look intently together, to share and observe and enthuse about our finds and to enter the absorbing quiet place together.